Size doesn't matter. Making customers happy drives a bank's success. Banks are almost by definition big institutions. Even the smallest community banks manage hundreds of millions or billions of dollars of assets. However, the best bank stocks need not be super-sized like the trillion dollar plus megabanks to provide attractive shareholder returns. Some banks bend the traditional "branch on every corner" business model, finding great success by focusing on specific customers that provide unique advantages operationally and financially. Here are three such banks investors should pay particularly close attention to. SVB Financial Group (NASDAQ:SIVB), which operates as the Silicon Valley Bank, specializes in the venture capital and start-up niche in Silicon Valley and other entrepreneurial hubs around the globe like Boston, New York, and beyond. The bank accepts deposits from both the operating companies themselves as well as from the venture capital firms that provide these companies with equity financing. SVB Financial's most current financials report total assets just shy of $45 billion, with returns on equity over the past 12 months at a solid 10.8%. Second, there is First Republic Bank (NYSE:FRC). First Republic's primary business is making mortgage loans, accepting consumer deposits, and offering complimentary financial products to high-net-worth customers in nine carefully chosen markets on the east and west coasts. The company focuses on providing exceptional service standards to court these highly sought-after and lucrative customers, and then deepening the relationship with them by cross-selling a myriad of other carefully chosen products designed to meet the specific needs of each high-net-worth customer. At last count, First Republic reported assets of just over $58 billion. Return on equity over the last 12 months was 10.1%. Next, we have New York Community Bancorp (NYSE:NYCB). New York Community Bancorp doesn't target Silicon Valley or a client base of wealthy elites. It has instead chosen to target a very specific type of asset financing -- rent-controlled apartments in the New York City metro area. The cash flow from these buildings is very predictable thanks to very high occupancy rates, making it the perfect asset for a bank to finance. New York Community made it its mission to build a business based on the financing of these specific buildings, and in doing so, the bank has flourished over the long term. In the fourth quarter of last year, New York Community agreed to acquire Astoria Financial Corporation (NYSE:AF). That acquisition will push New York Community over an important regulatory threshold of $50 billion in total assets, increasing regulatory supervision and costs. Management has indicated that once that regulatory hurdle has been passed, the bank plans to increase its focus on growth to overcome and scale its operations to offset the increase in regulatory costs. That's significant because it likely means a diversification into new loan types and away from its bread and butter niche in New York City apartment buildings. Costs related to the acquisition pushed New York Community Bancorp to a large, non-recurring loss in the fourth quarter. Prior to the acquisition-related losses, the bank's return on equity was consistently between 8% and 9% for the past several years. Total assets, which are again set to grow in the coming months and years, were $50.3 billion at last quarter's end. Most appealing, though, has been the bank's 4.3% dividend yield: among the highest of all medium to large bank stocks. In each of these three examples, the bank's unique business model and customer focus provides competitive advantages in the marketplace and specific benefits to investors. SVB Financial, for example, is able to leverage its relationships with venture capital firms to provide huge sums of low-cost deposits and add powerful credit quality enhancements when lending to high-risk start-ups. For example, if a start-up company is experiencing red-hot sales and needs financing to grow its inventory, SVB can give the company the line of credit it needs despite the relatively high risk of the loan. To mitigate the credit risk, the bank can ask the venture capital firm backing the start-up to guarantee the loan. In this way, if the start-up did end up failing -- as so many do -- the debt would be covered by the venture capital firm, saving the bank from any losses. As of last quarter, the bank's ratio of severely delinquent loans and forecloses -- its non-performing assets -- to total assets was a slight 0.28%, less than half the average of other large U.S. banks. 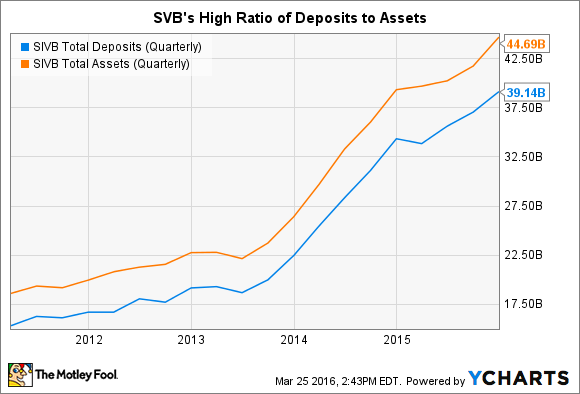 SIVB Total Deposits (Quarterly) data by YCharts. For investors, the bank's cheap deposit base provides low-cost funding and helps to improve profitability and operating leverage. Likewise, the strong credit profile reduces loan losses over time, which is arguably the most significant factor in long-term bank stock success. First Republic's greatest advantage is the financial strength of its customer base. These individuals have very high credit scores, tend to provide very large down payments when buying homes, and have large sums of liquid assets available as potential deposits, investable assets, and credit quality enhancements for the bank. They also bring logical cross-selling opportunities with the businesses they own, the insurance products they need, and the retirement and estate planning services their families rely on. First Republic's credit quality is exceptional in the industry, with a non-performing assets to total assets ratio at a scant 0.12% last quarter. The proof of these advantages is in the stock's performance. First Republic has absolutely crushed the performance of the S&P 500 over the past 1-year, 5-year, 10-year, and 15-year periods, adjusting for a short period around the financial crisis, when the bank was sold to and then repurchased from Bank of America. The chart below shows the stock's performance since its IPO following the Bank of America era. The biggest investor advantage from New York Community Bancorp's model over the past few years has been the bank's impressive dividend. The bank slammed the brakes on growth in front of that $50 billion total asset regulatory mark several years ago, relied on the steady and predictable cash flow from its apartment loan portfolio, and paid out a high ratio of its profits to investors as dividends. That made shareholder returns consistent and large. Common with both SVB and First Republic, New York Community's model also provides for strong credit quality metrics. The bank's non-performing to total assets ratio was the same as First Republic's in the fourth quarter, just 0.12%. The average of a sample of 59 large U.S. banks, for context, was 0.65% for the same quarter. In light of the Astoria Financial acquisition and management's indication that the bank is turning the growth spigot back on, the future of the dividend has grown more murky. 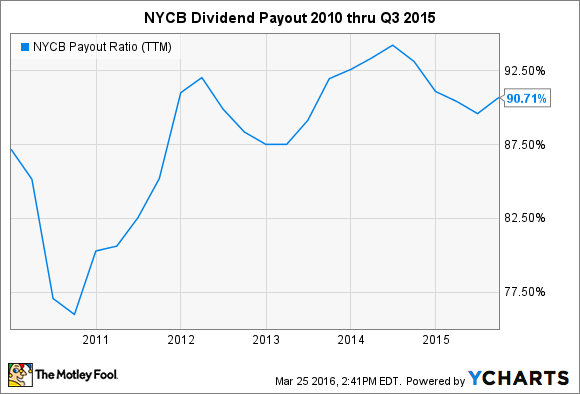 Many analysts predict that the bank's dividend payout ratio will shrink substantially to fund the bank's new growth, meaning a dividend yield much more in line with the rest of the industry. The question going forward, then, is if the bank will be able to translate new growth into enough new earnings per share to compensate for the reduced dividend. At this point, it's still too early to tell. NYCB Payout Ratio (TTM) data by YCharts. Each of these three banks have elements of the traditional bank model. They each accept deposits and make loans as a primary source of profits, for example. However, they each took that basic formula and customized it to fit the precise needs of a very specific set of customers. The goal wasn't to serve all customers adequately; it was to serve a select group of customers exceptionally. In these three cases, that strategy has worked quite well over time. 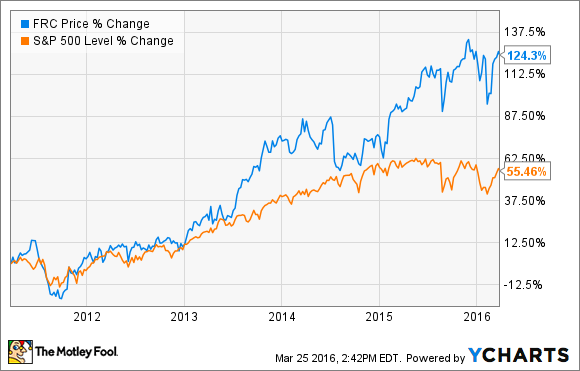 Is New York Community Bancorp a Buy?